We have been in the Bahamas for almost four months. Yet, Abraham’s Bay, Mayaguana has been one of my favourite places to visit. Everyone we met had something to give. The culture of generosity and community was infectious. It extended from the dinghy dock and onwards into town. Each act of generosity could be expanded upon. But, here is the short story. The story of giving starts with a woman who had lovely shoes. She helped us get oriented on our first visit into the settlement of Abraham’s Bay. Treading on a rocky path, this woman left her air-conditioned office to point us in the direction of the grocery store. The grocery store was in a large shed with no signage so I was glad to have had her help. It turns out her daughter is the proprietor of the grocery store. On our second visit into town, we met LeRoy at the dinghy dock. LeRoy drove a shiny Kia cube car, and worked for the government. His wife worked in the customs office. LeRoy offered us a drive to the play park. The play park was a bit dilapidated but the kids had a marvelous time. We did some grocery shopping. After we bought the carrots, a woman offered us a drive to the dinghy dock, which I gladly accepted. As she said, it was very hot. At the dinghy dock, we met a fisherman. It seemed that he was also caught by the community spirit and had something to give. He offered fresh conch. On the third day, before we got to town, a different fisherman suggested that he collect us some conch slop. He said it was excellent bait and we had to have some for fishing. By slop, he was referring to the parts of the conch that the fishermen cut off and usually go to waste. He too had something to give. He left the conch slop in a container in our dinghy while we are at the play park. After leaving the fisherman, our destination was the play park. And, now it was our turn to give. Using a rope from our boat, we fashioned a swing with the rope and a thick piece of pipe that was lying on the ground. Here is a picture of the swing that we made. Shawnny on the swing that we made. Some local kids joined us at the play park. Henry made a friend with a local boy called, Shawnny. Shawnny was four years old. Eager to make friends, Henry, who is five years old, asked to bring cake on our next visit to the play park. Later, as we sat in the shade under a pavilion, LeRoy came by and brought us water and cold beer. He then offered to drive our entire family on a sightseeing trip to a former US Army base. 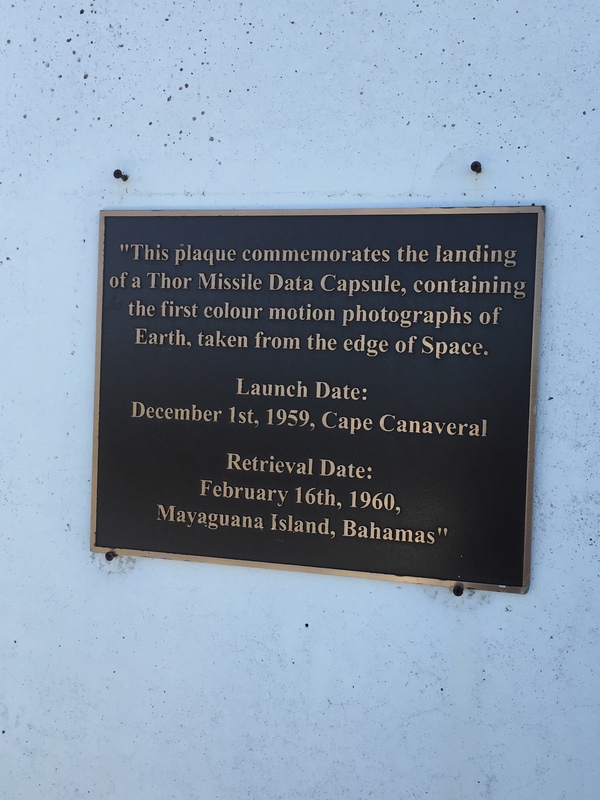 Here is a picture we took of a plaque at the base. Our trip was of particular interest to my husband who studied Space Physics. As a result of our visit, our daughter Betty is now interested in U-2 spy planes. Commemorative plaque at the site of the former US Army Base. On the fourth day, the kids were excited to see their friends again. We brought a chocolate cake and iced it in a pavilion near the park. We waited and finally visited their house to invite them to the park. They were already on their way to the park. Here is a picture of us enjoying cake with our new friends. 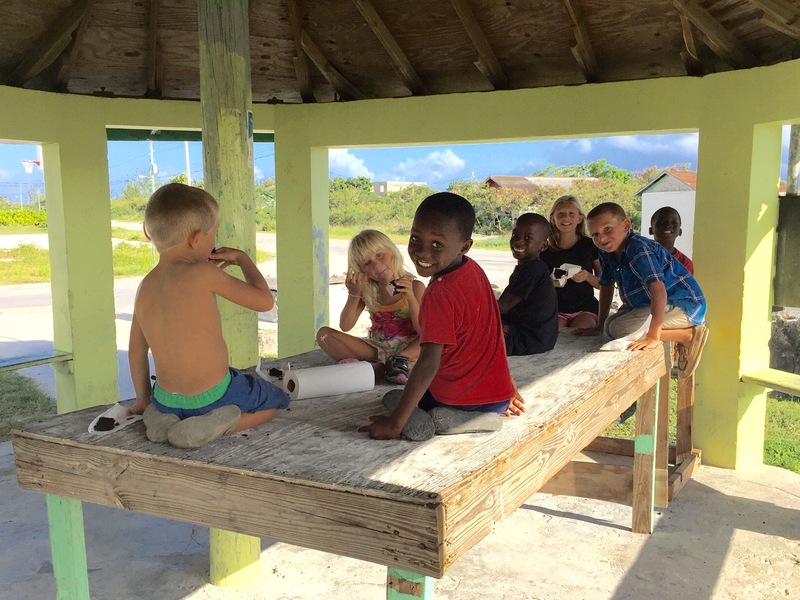 Our kids with their new friends in Abraham’s Bay, Mayaguana. 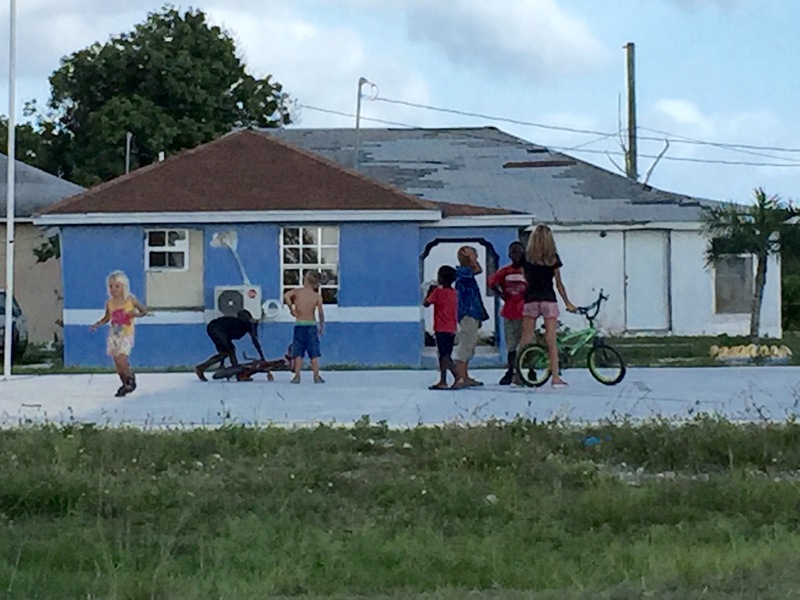 Later, the local kids shared their bikes with our children. Our kids were thrilled to be on bicycles again. A couple of local people helped Henry to learn to pedal. Our kids were excited to use bicycles for the first time in many months. A local man helps Henry learn to pedal. We also met Scully. Scully is a fishing guide. 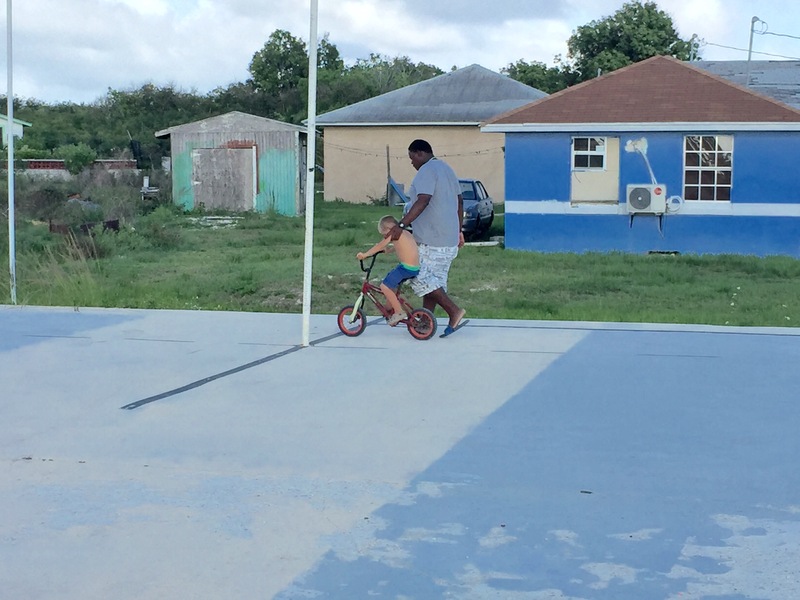 He rode over on his bike to chat and invited us to community cookout Saturday night. Unfortunately, we felt we could not attend because we had checked ourselves out of the country and would be flying our quarantine flag once we returned to Aphrodite. Once that yellow flag is up you cannot return to land without checking back into the country with immigration. On fourth day, which was Friday, we checked out with Bahamas immigration. On Sunday we’re going to Southeast Point. We will be leaving the Bahamas on Monday morning. We will leave at about 2am, and plan to be in Provo in the Turks and Caicos by mid-morning. Hi there, you all. It’s nice to catch up on your local flavour experiences. It sure sounds like you’re having a blast. Great pics btw. Come again any time, we love meeting new people!